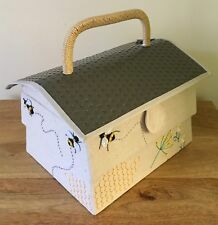 FABULOUS 'BEE HIVE' SEWING BASKET. Bee Hive shape with beautiful appliqued bees, flowers and honeycomb. Storage drawer. Plastic storage tray accessories. Large Size. STUNNING UNIQUE DESIGN. SIZE APPROX. 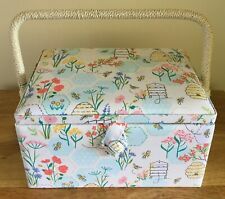 FABULOUS 'BEE HIVE' SEWING BASKET. Bee Hive shape with beautiful appliqued bees, flowers and honeycomb. Plastic storage tray accessories. Open top lid with a storage area. Small Size. STUNNING UNIQUE DESIGN. Wooden basket storage manager box. Wooden sewing set. 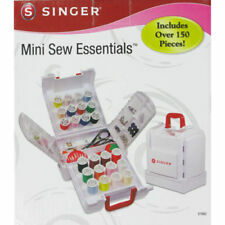 High-quality multi-functional sewing kit-This cute sewing kit has all the necessary tools you. 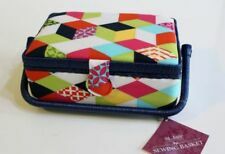 Needle and thread storage box. 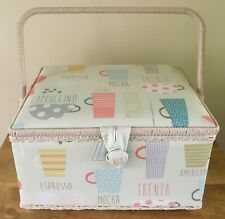 Sewing storage box retro craft. In very good overall condition with a few slight marks. Fantastic looking piece. Depth 14"(36 cm.). Height 17.5"(44 cm.). 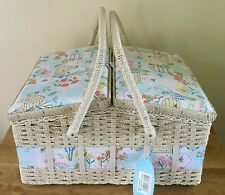 FABULOUS 'SEWING BEE' SEWING BASKET. Pretty design with bees, flowers and bee hives. STUNNING DESIGN. Large storage area. All the photos are of the actual item, taken by us. We do not use the manufacturers enhanced photos. 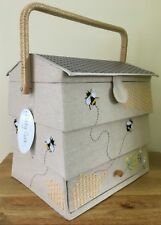 FABULOUS 'SEWING BEE' SEWING BASKET. Pretty design with bees, flowers and bee hives. Large Size Twin Lid. Angled twin lid. Large storage area. STUNNING DESIGN. Large Size. Large storage area. CLASSY DESIGN. SIZE APPROX. All the photos are of the actual item, taken by us. We do not use the manufacturers enhanced photos. 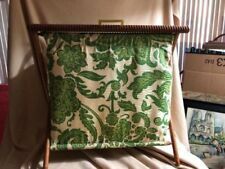 As a nice Faux inlay Designed to it, it is lined inside with blue velvet all this is clearly shown in my. This item is pre-owned and has wear consistent with age and use. The production of box-work or Mauchline ware took place from the 1820s until 1933 by the firm of W & A Smith. These went from Mauchline to the Isle of Wight. Fernware was introduced in the 1870s. This involved applying actual ferns to the wood which was then stippled in dark brown, the ferns removed and the wood varnished. A rare antique Tunbridge-ware pincushion sewing box by Edmund Nye. Decorated all around the sides with scrolling leaf design with satinwood ebony banding. Standing on 4 little bun feet.The compartments either side of pincushion would originally been used for perfume bottles but could be used for holding other needlework items etc. Label to the base Edmund Nye, Tunbridge Wells. There is an identical box in "Tunbridge Ware" by Brian Austen on pg 152 but only attributed to him, so no label. Dates circa 1850. We are happy to combine postage for multiple purchases where possible. Cath Kidston Sewing Box Tin. Aqua Floral Design. 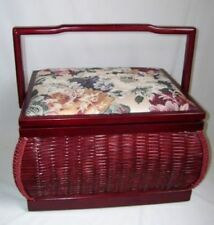 Wicker Sewing Basket. Basket Inclusive Of The Knitting Contents. Simple Little Basket. The Basket Is In Good Used Condition. Occasional Small Catches & Use Marks. With Expected Signs Of Use & Wear. Box retains the original lock, top catch and hinges. Instruction given once sold. MTS ANTIQUE JEWELLERY BOXES. The majority of our boxes are over one hundred years old. Its all normal for the age of any historic box. 1 Set Sewing Kit With Wooden Box. - Storage Box total size: Approx. Superb inlayed boxwood, and ebony banding to the top and front. Box retains the original lock, top catch and hinges. A bit stiff but does the job very well. Instruction given once sold. MTS ANTIQUE JEWELLERY BOXES. Three Tier Cantilever Sewing Box. Traditional Cantilever Box. Lightened Outlines To Where The Cantilever Arms Sit, Visible When Open. Of Good Generous Size. A Traditional Large. 43cm Wide x 24cm Deep x 32cm High. This Scottish Mauchline Ware jewellery box Was possibly made in southwest Scotland from the early 19th-century, The box is in nice original condition, as a good colour to the wood. Approximate Size: 23.2 cm x 12.4 cm x 5.1 cm. Transfer of SCALEBER FORCE SETTLE. The production of box-work or Mauchline ware took place from the 1820s until 1933 by the firm of W & A Smith. These went from Mauchline to the Isle of Wight. Fernware was introduced in the 1870s. A superb little rarity which will be loved by any Mauchlineware Collector. Conditions of Sale. 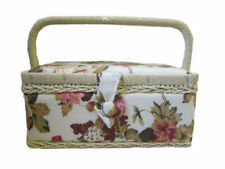 This sturdy sewing basket has a magnetic clasp closure.